When terrorists attacked our country on September 11, 2001, Paramedic Chris Page – then a high school senior – petitioned his principal for an early diploma. Two days later, he enlisted in the U.S. Army. Chris served two years before suffering a devastating injury in Iraq that ended his military career. 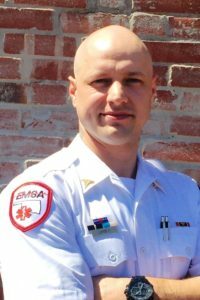 He spent several months recovering, and a few years doing odd jobs, before finding his way into EMS about four years ago. Last winter, Chris responded to a call for an extremely premature baby who was born at home, with the umbilical cord wrapped around her neck. The baby was unresponsive and had a slow, weak heartbeat. Chris removed the cord, provided chest compressions and successfully intubated the 1-pound patient. By the time they arrived at the hospital, the baby had a strong heartbeat. She is continuing her recovery today.